A wildfire that threatened a nature reserve in southern Spain designated as a World Heritage site has been brought under control, officials said Tuesday after evacuating over 2,000 people including tourists. 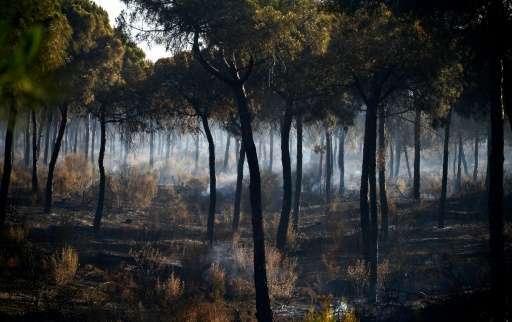 The blaze near Huelva in the Andalusia region has affected a vast area but not yet the Donana National Park, a UNESCO World Heritage site well known for the extensive biodiversity of its dunes, wetlands and woods. The fire, which started Saturday but caused no victims or injuries, "is considered under control," Andalusia's INFOCA fire control authorities said on their Twitter account, which means it is still burning but has been contained. A reconnaissance flight over the affected zone showed that the blaze was on the wane after three nights of fire-fighting, Andalusia's central government representative Antonio Sanz Cabello said. Nearly 130 firefighters and 12 trucks were mobilised overnight to bring the fire under control. It had already started to die down as the wind dropped late Monday. The blaze comes a week after wildfires killed over 60 people in neighbouring Portugal. There has been no official estimate regarding how much land has been burned but the WWF estimates it has so far affected about 10,000 hectares (25,000 acres). The fire prompted the closure of several roads and the evacuation of some 2,100 people, including guests at camp sites and several hotels. According to Sanz Cabello, the remaining people who had to spend the night in reception centres—some 230—"can go home". The Donana National Park and the surrounding area is one of Spain's most important wildlife sanctuaries and a popular tourist attraction. It is home to a variety of animals, including endangered species such as the Spanish imperial eagle and the Iberian lynx, a large cat found only in Spain and Portugal. It also acts as a crucial refuge for Europe's Africa-bound migratory birds. According to regional authorities, the start of the blaze is likely man-made, though they don't know as of yet if it was intentional or not. It took place as Spain experiences a particularly bad drought.